Created in the last century by a well informed garden lover, it was left to abandon for several years until the council bought it in 1973. During the important restoration period, many trees, bushes and climbing plants unknown until then in the area were discovered. Later on, the name giving tower was restored as well as the glass house, the pond and the green spaces. In 1981 the garden was opened to public use and the decision taken to develop a botanical garden. In 1990, a first inventory counted 200 species and varieties of plants, today there are more than 700. This park, whose aim it is to be at the same time a well frequented public park and a botanical garden is continuing to develop and has now several collections of its own. January 1st at December 25th, every day except monday. January 1st at March 31th : from 10 am to 5.30 pm. April 1st at September 30 th : 10 am to 8 pm. Free or guided tours by appointment. 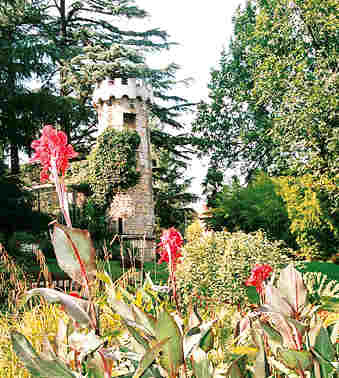 The Park of the Old Tower is located at Southern of the Alès City in Gard (30). By A7, exchanging at Bollène (70 kms), then by Bagnols on Cèze (D 6). By A9, exchanging Nimes west (40 kms), then by RN 106.